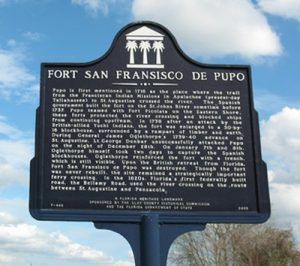 Fort Fransisco De Pupo Historic Marker, Clay County, Florida. The site of Fort Francisco De Pupo, Florida is first mentioned in 1716 as the place where the trail from the Franciscan Indian missions and the Apalachee (Tallahassee) to St. Augustine crossed the St. Johns River. The Spanish Government built the fort in 1734 in anticipation of more attacks by the English and their Indian allies. Fort Pupo teamed with Fort Picolata on the Eastern shore to protect the river crossing and block ships from continuing upstream. In 1738 after an attack by the British-allied Yuchi Indians, the fort was enlarged to a 30-by-16 blockhouse, surrounded by a rampart of timber and earth. During General James Oglethorpe’s 1739-40 advance on St. Augustine, Lieutenant George Dunbar unsuccessfully attacked Fort Pupo on the night of December 28th. On January 7th and 8th, Oglethorpe himself took two days to capture the Spanish blockhouses. Oglethorpe reinforced the fort with a trench, which is still visible. Upon the British retreat from Florida, Fort San Francisco de Pupo was destroyed. Though the fort was never rebuilt, the site remained a strategically important ferry crossing. In the 1820’s Florida’s first federally built road, the Bellamy Road used the river crossing on the route between St. Augustine and Pensacola. There is a historic marker in Green Cove Springs, Florida on Leonard C. Taylor Parkway (Florida Route 16), on the right when traveling east.